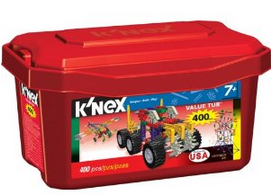 Amazon: Knex 400 Piece Tub just $11 Shipped! Christmas is coming up and this price is cheaper than ever! 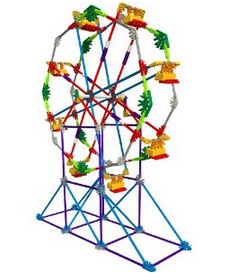 Amazon has the Knex Value Tub 400 pieces for just $10.97 (reg. $24.99)! Shipping is FREE with Prime. This is the cheapest you’ll see this set all year. If you’re interested, buy now and save it for Christmas! Don’t forget about your $5 Amazon gift cards from Swagbucks! https://savvywifehappylife.com/wp-content/uploads/2016/09/SavvyWifeHappyLife-logo-2.png 0 0 Brandi https://savvywifehappylife.com/wp-content/uploads/2016/09/SavvyWifeHappyLife-logo-2.png Brandi2012-11-30 23:51:052012-11-30 23:51:05Amazon: Knex 400 Piece Tub just $11 Shipped! Lots of new coupons popped up today! I would recommend printing your favorites since we’re nearing the end of the month. Coupons will start to disappear and/or reset, so get printing! It looks like we’ll be getting 2 inserts: A Smartsource and a RedPlum! You can follow the link and check out the coupons we should be expecting this weekend. Let me know if you see anything exciting! https://savvywifehappylife.com/wp-content/uploads/2016/09/SavvyWifeHappyLife-logo-2.png 0 0 Brandi https://savvywifehappylife.com/wp-content/uploads/2016/09/SavvyWifeHappyLife-logo-2.png Brandi2012-11-30 09:33:322012-11-30 09:33:32Sunday Coupon Preview! https://savvywifehappylife.com/wp-content/uploads/2016/09/SavvyWifeHappyLife-logo-2.png 0 0 Brandi https://savvywifehappylife.com/wp-content/uploads/2016/09/SavvyWifeHappyLife-logo-2.png Brandi2012-11-30 09:14:592012-11-30 09:14:59It's Mega Swagbucks Day! Get Free Amazon Gift Cards! If you’re familiar with Bar Keeper’s Friends, you know it’s great for stainless steel cleaning, as well as scrubbing your tub which my dad did last week. He wasn’t aware that the BKF sitting on our counter is my trusty Pyrex cleaner -not to be used by anyone else! It works like magic taking off stuck on crap and utensil marks on my vintage pieces. So there’s a tidbit for ya! You’ll find BKF at the grocery store around $2-$3, so inexpensive after the $0.50 off ONE (1) BAR KEEPERS FRIEND Cleanser coupon and doubles. My Safeway had it for $1.99, so just $0.99 after coupon. https://savvywifehappylife.com/wp-content/uploads/2016/09/SavvyWifeHappyLife-logo-2.png 0 0 Brandi https://savvywifehappylife.com/wp-content/uploads/2016/09/SavvyWifeHappyLife-logo-2.png Brandi2012-11-29 23:58:372012-11-29 23:58:37ShopRite: Free Colgate Toothbrushes! 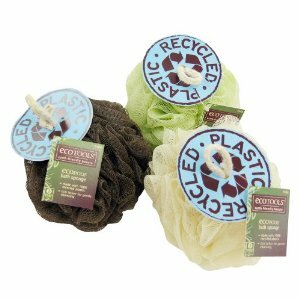 (RESET) New $1/1 EcoTools Coupon = FREE Sponges at Walmart and Target! This coupon reset which means more freebies! You’ll definitely want to print this coupon for $1.00 off 1 (one) EcoTools products! https://savvywifehappylife.com/wp-content/uploads/2016/09/SavvyWifeHappyLife-logo-2.png 0 0 Brandi https://savvywifehappylife.com/wp-content/uploads/2016/09/SavvyWifeHappyLife-logo-2.png Brandi2012-11-29 22:38:292012-11-29 22:38:29(RESET) New $1/1 EcoTools Coupon = FREE Sponges at Walmart and Target! 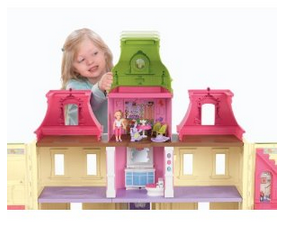 Amazon: Loving Family Dollhouse just $50 Shipped (Reg. $90)! Amazon has the Fisher-Price Loving Family Dream Dollhouse with Caucasian Family for just $49.99 shipped (reg. $90)! You know it would make an awesome Christmas gift 🙂 My Loving Family dollhouse was one of my favorite toys when I was little! https://i1.wp.com/savvywifehappylife.com/wp-content/uploads/2012/11/dollhouse.png?fit=287%2C248&ssl=1 248 287 Brandi https://savvywifehappylife.com/wp-content/uploads/2016/09/SavvyWifeHappyLife-logo-2.png Brandi2012-11-29 22:03:282012-11-29 22:04:10Amazon: Loving Family Dollhouse just $50 Shipped (Reg. $90)! Enter to Win a Free KitchenAid Stand Mixer! Sweet! I better win this! https://savvywifehappylife.com/wp-content/uploads/2016/09/SavvyWifeHappyLife-logo-2.png 0 0 Brandi https://savvywifehappylife.com/wp-content/uploads/2016/09/SavvyWifeHappyLife-logo-2.png Brandi2012-11-29 16:18:592012-11-29 16:18:59Enter to Win a Free KitchenAid Stand Mixer! 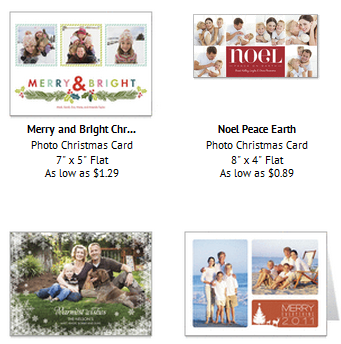 *HOT* Cardstore: 75% off + FREE Stamps = Card + Stamp less than $0.22! I’m posting this deal because it is one of the best ones I’ve seen yet and I hope, if you haven’t already ordered your cards, that you take advantage of this deal. Keep in mind that this deal is good through tonight. So get movin’. This deal is SO great because you can score your cards, envelopes, already addressed AND STAMPED for less than the cost of a stamp. How is that even possible?! 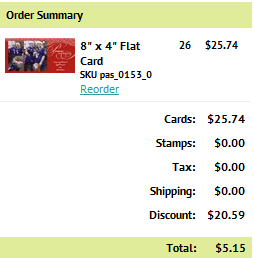 I have not a clue how CardStore.com can give us such great of a deal, but it works. I did these last year and it worked perfectly. Hopefully I’ll have time to take advantage of the deal again! The cards come in envelopes, addressed, with stamps and sent to your recipient. I paid about $0.30 each including the stamp, but your cost will be even lower if you’re ordering in bulk, depending on the style you choose! Obviously the simpler, smaller cards will be cheaper, but as long as your cost is $0.45 or under, you’re good to go -since that’s the price of a stamp, so that’s like a free card! Because this deal gives you personalized cards LESS than the cost of buying cheap cards and stamping them yourself, please do this deal! Let me know if you have questions! https://savvywifehappylife.com/wp-content/uploads/2016/09/SavvyWifeHappyLife-logo-2.png 0 0 Brandi https://savvywifehappylife.com/wp-content/uploads/2016/09/SavvyWifeHappyLife-logo-2.png Brandi2012-11-29 15:47:482012-11-29 15:47:48*HOT* Cardstore: 75% off + FREE Stamps = Card + Stamp less than $0.22!